IDENTA LC Nano Hybrid Composite Flow is a light-curing flowable restorative combining proven composite technology with innovative nanotechnology. IDENTA LC Nano Hybrid Composite Flow is radiopaque, highly filled and methacrylat based (Bis-GMA, TEGDMA, HEDMA, UDMA) and cures under blue light (halogen or LED). It is suited for restorative therapy in anterior and posterior areas. Because of its low viscosity, the material exhibits very good wetting and adaptation to cavity walls. 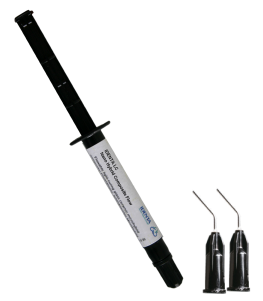 IDENTA LC Nano Hybrid Composite Flow is used with a dentine/enamel bond.